On June 29, 1870, the bodies of 50, NOT 1,200 Chinese dead arrived in Sacramento by train for reburial, and not all of this much smaller number had died of railroad construction accidents. Many thanks to Wendell Huffman for finding this historical evidence. ... here is a report of – apparently – the same train. But what a different number! Sacramento Union, June 30, 1870. "BONES OF DEFUNCT CHINAMEN — The Central Pacific freight train last evening brought to the city the bones of about fifty defunct Chinamen who died from disease or were killed by accident while working on the line of the Central Pacific Railroad. They are to be interred in Conboie's private cemetery, as have been already the bodies of about one hundred others similarly deceased." Sacramento Reporter, June 30, 1870. "BONES IN TRANSIT. — The accumulated bones of perhaps 1,200 Chinamen came in by the eastern train yesterday from along the line of the Central Pacific Railroad. The lot comprises about 20,000 pounds. Nearly all of them are the remains of employees of the company, who were engaged in building the road. The religious customs of the Celestial Empire require that, whenever possible, the bones of its subjects shall be interred upon its own soil, and the strictness with which this custom is observed is something remarkable." Elko Independent, January 5, 1870. "DEAD CHINAMEN — Six cars are strung along the road between here and Toano, and are being loaded with dead Celestials for transportation to the Flowery Kingdom. We understand the Chinese Companies pay the Railroad Company $10 for carrying to San Francisco each dead Chinaman. Six cars, well stuffed with this kind of freight, will be a good day's work. The remains of the females are left to rot in shallow graves while every defunct male is carefully preserved for shipment to the Occident." ... I'm not sure the stories are contradictory – perhaps both correct, but neither telling the whole story: 1200 bodies going home to China, 50 buried locally. But why the inconsistency? But a classic example of two people seeing the same event and seeing different things; and an example of how frustrating and challenging history can be. "How many died building the Central Pacific Railroad? ... probably about 100-150 Chinese died building the railroad (this based on the very specific reports at the time) ... the number of documented fatalities during the CPRR construction reported by those actually participating is quite small, perhaps less than 50 [actually, (15-20)+2+(4-5)+4+(3-5)=(28-36)] ... this newspaper guess of 1,200 killed ... appears so doubtful ... this solitary and internally inconsistent newspaper article's likely overestimate of casualties ... Can you provide other information about construction related casualties so that we can better evaluate the accuracy of this newspaper guess ... ? ... Are deaths from smallpox being confused with construction accidents?" Now, we discover that the newly found Sacramento Union newspaper article published on that very same day exactly confirms the prediction, reporting 150 total "Chinamen who died from disease or were killed by accident" (with 50, not 1,200 corpses on the train that day). This is the most strikingly successful example of something approaching the scientific method that one is ever likely to encounter in historical research, as the newly located newspaper account both contradicts the report that was predicted would be found to be wrong, and confirms both the number of casualties and range of causes of death to be just as had been predicted. It is a mistake to try to reconcile two reports about what occurred in Sacramento on the very same day which quantitatively are in utter contradiction. Absent the discovery of further evidence, the only reasonable conclusion is that the erroneous notion of "thousands killed" in building the Central Pacific Railroad is a myth arising from a wildly mistaken report by a single journalist, which now has been debunked. I must point out that the two stories are not necessarily mutually exclusive. There may have been 50 bodies slated for reburial in Sacramento (which in itself is interesting) and approximately 1200 being repatriated to China – all on the same train. I personally don't find 1,200-odd deaths over two to three years by disease and accident unlikely. Taking the ratio we see in the contemporary Civil War of 2-3 deaths by disease to every one killed in combat, and recognizing that working on the railroad wasn't nearly as dangerous as having folks shoot at you, 100-200 deaths by accidents out of those 1,200-odd bodies is possible, and not that much different from what the newspaper reports of accidents suggest. Factor in that some of the bodies were not of former railroad workers, and that some of the deaths did not happen when those that were railroad workers were actually employed on the railroad, and you may be down to 100 or so railroad construction accidents. Others have mentioned the small pox along the railroad in 1868-69. As I sit here in sub-freezing temperatures at mid-day, and listen to reports of sub-zero night-time temperatures in eastern Nevada, I wonder what role the weather may have played in those deaths. It gets cold in China, but weren't most of these workers from southeast China? No way to know for sure, but attempting to make two reports of 50 vs. 1,200 not be contradictory, just seems to strain credulity too far. But whether there were about a thousand deaths due to smallpox in Nevada, or a much smaller number, either way there seems to be agreement that there were not large numbers of preventable deaths due to construction accidents which is the myth that is being rebutted, and no basis whatever for a mistaken belief that the railroad management was indifferent to worker safety. Wow! Thanks for this update. Was the original 1200 based on guesses, media drama, or what? Hard to tell from the short newspaper article. True, there was an article stating that 50 bodies arrived, but it was a day before the article (in a different Sacramento paper) that estimated (I emphasize that the reporter was not at all certain) the 1200 Chinese. It might have been separate trains on two succeeding days - or it might be two articles in different papers talking about the same train. The article about 50 bodies was on June 30, citing a train of the previous evening. The article about 1200 bodies (maybe) was on July 1, citing the previous evening. We have received an e-mail challenging your citation [1,200] that this was actually published on June 30, 1870. Can you please supply full newspaper page images sufficient to prove the newspaper publication date? We have received an e-mail challenging the cited June 30, 1870 publication date. Can you please supply full newspaper page images sufficient to prove the newspaper publication date? Both articles are stated (by Chris Graves and Wendell Huffman, respectively) to have been published on June 30, 1870 and both refer to the previous day's train stating "yesterday" and "last evening." What is the factual basis for challenging the cited publication dates and your saying instead "a day before" and "(maybe) ... July 1"? Sorry, I cannot. The microfilm has been returned to California. Besides, the piece appears on page three (second or third column), and I believe the date does not appear on that page but on the top of page one and two, so it will be impossible to get a single image of both the article and the date. However, since I was considering that there may have been another train on a different date and I wasn't wholly confident in the citation of the Reporter article, I searched papers on both sides of 30 June and came back to the article several times for both directions. It is always possible I was off, and I would love to have someone verify this. Nevertheless, I am confident the citation is correct. I plan searching the Bee in the next few days. Now, the Reporter story is not one that I have seen personally, so I cannot attest to that citation date. Besides, it is the challenger's responsibility to prove their negative. The item in question is recorded on microfilm in the California State Library, the California Room, upstairs at the intersection of 9th and N St., Sacramento. The entire issue of this newpaper, as well as most all newspapers published in California, from 1850 to the current date, are in the State Library. For someone who lacks the character to accost me to my face, but rather goes thru the CPRR Museum to question my veracity, I would suggest that they also read Nameless Builders of the Transcontinental by William F. Chew, where, on page 99 he quotes the article in question in its entirety. Now, that book makes me uneasy in many ways, but no where does Mr. Chew mis-quote a newspaper article. I live some 40 miles from the Library, and when I do go there for research, the day is pretty well taken up in travel time and searching for a parking place. Following the good work by Ms. Posehn, I will, provided you furnish me the address of your questioning correspondent, send him/her a box of crow feathers upon which he/she will be expected to dine. On a personal note, I find that the claim of 1200 bodies on that train noted in the article is most likely humbug, and the writer of that article a personal nuisance with a personal curse. Many honest minds have been perverted to their ruin, while a few cheats that write such stuff have reaped temporal benefits of the great imposture. At the start, the notion of the great killings of Chinese workers was bad enough and repugnant enough to morality and common sense; yet it has grown constantly worse, just as the owners of the slander have increased. That being said, it must be shown that the progenitators of such trash have, in various news articles printed in the 19th and 20th Century, some small twigs upon which to hang their hats, the June 30, 1870 Reporter being one on them. For the Museum to publish this article is more than fair, as all questions must be answered. But to question the messenger, that humble person being the writer of this missive, and to suggest that I would create such an article from whole cloth is to create pity for such a creature. I wish him/her well in their search for the truth of the Chinese experience on the CPRR, and suggest that instead of reaching out to the delivery vehicle of such an article, go to the newspaper directly, and read for themselves the piece in question. And, should it not be quoted precisely as the microfilm copy suggests, THEN surface the concern. History and a misreading of truth do not mix well. I should think, from this distance, that the questioner of this writer is a bit of a villainous, wholesale calumniator, most likely full of self importance, fond of intrigue, and a bit of a hypocrite. Scholarly studies of the newspapers of the 19th century are an enlightening exercise, your questioner would do well to read them. —G J Chris Graves, NewCastle, Calif. I have just returned from the Nevada Historical Society in Reno. On a whim I asked if they had Sacramento Union, and they have the actual papers bound. I turned to 30 June 1870 and found the article, just as it was on the microfilm. I am confident the citation of Sacramento Union, 30 June 1870, p.3 is absolutely correct. Unfortunately, there was no Bee in their collection or over at UNR. Not sure whether or not this was query to Wendell was in response to my note or not. I was not questioning the dates we have ascribed to the articles (June 30, 1870 for Sacramento Union; July 1, 1870 [sic] for Sacramento Reporter), although it is certainly nice to have the Union date confirmed, and would be nice to see the Reporter's date also confirmed. Rather, the publication dates of the two papers in question suggest that there MAY have been two trains, one each night before publication. Wendell's past experience cross-checking the Union and the Bee is that often one paper will pick up an item missed by the other, so maybe something will turn up there. "The Sacramento Reporter reported the arrival of a train in Sacramento on June 30, 1870 [sic], under the headline 'Bones in Transit.' 'The accumulated bones of perhaps 1,200 Chinamen came in by the eastern train yesterday from along the line of the Central Pacific Railroad.' which I took to mean the TRAIN arrived on June 30 [sic], thus the article on July 1 [sic]." "Then, on June 30, 1870, in the SACRAMENTO REPORTER: 'Bones in Transit – The accumulated bones of perhaps 1,200 Chinamen came in by the eastern train yesterday from along the line of the Central Pacific Railroad. The lot comprises about 20,000 pounds. Nearly all of them are the remains of employes of the company, who were engaged in building the road. The religious customs of the Celestial Empire require that, wherever possible, the bones of its subjects shall be interred upon its own soil, and the strictness with which this custom is observed is something remarkable.' "
So clearly now I agree that the Union article and the Reporter article came out on the same day. Note I never questioned Wendell's citation of the Union article as being on June 30. Both newspaper articles were published on June 30, 1870, and both refer to a CPRR train arriving in Sacramento the previous day, June 29, 1870. The two articles are in conflict as to the numbers of deceased Chinese whose bones were on the train, one article stating about 50, the other 1,200. Well, Bill Chew did have the date correct on the article, but cited it in a sentence where it wasn't clear whether the date applied to the arrival of the train, or to the publication of the newspaper. I guessed that it was the arrival of the train – but I was wrong in that. Anyway, as Wendell noted in one of his replies, the Union article is talking about Chinese who's bodies were to be buried in the Sacramento cemetery (whether temporarily or permanently is not addressed in the article). The Reporter article is talking about Chinese who's bodies were on their way for shipment back to China. These are not necessarily in conflict, since it could be two separate shipments on the same night. As is so often the case, we need additional information. Perhaps the Bee will have something. Or San Francisco Bay Area papers my shed more light on the shipments out of San Francisco bound for China. I do grow tired of people simply counting up Chinese reported as deceased in newspaper articles, and on that sole basis trying to make definitive statements about how many Chinese died in the construction of the railroad. While the newspapers provide some valuable evidence, taken by themselves (without additional comparative examples and analysis of other sources of info) newspapers will NEVER provide us with anything approaching an accurate answer to that question. "arrival of a train in Sacramento on June 30, 1870"
"the TRAIN arrived on June 30"
Disagree: While other interpretations are possible, absent further information, the two Sacramento articles (both on June 30, 1870) most likely are describing the same event (the arrival of a train on June 29, 1870). The descriptions seriously conflict with one another, and one is likely to be wrong. Apparently conflicting reports, without further evidence, limit what can be known. We make no claim as to the actual number of Chinese workers who died in CPRR construction accidents, only that due to the conflicting June 30, 1870 articles (the bones of 50 versus 1,200 Chinese dead transported to Sacramento for reburial and arriving on June 29, 1870), and all the other reports being specific and of very small numbers (perhaps up to 36 total) the historical record supports only an upper limit of less than 150. The number 150 also includes an unknown number of deaths due to illness, such as smallpox. Deaths of Chinese workers due to illness were beyond the control of the CPRR. The actual number of construction accident fatalities is unknown, and based on the currently available record, can never be known. Wendell Huffman has made a valuable contribution by discovering this additional newspaper account. Any help in compiling copies of every known fatality report into a single document will be greatly appreciated. I am told that the Winnemucca newspaper, somewhere in the month of March, 1870 has an article that speaks to this; paraphrased "In March, 1870, the Chinese funeral car as working in Winnemucca on a siding near the present Bridge St. crossing preparing the deceased for their final trip home. Two car loads of bones, prepared and boxed in the most approved manner, and labeled with the appropiate Chinese characters, which gave name, date of death, on tong to which they belonged were shipped from Winnemucca to San Francisco at that time." I have pulled my copy of the Sacramento Reporter, on it I noted "June 30, 1870." 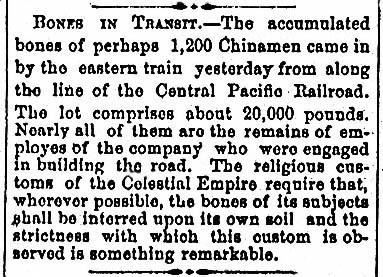 "Bones in Transit—The accumulated bones of perhaps 1,200 Chinamen came in by the eastern train yesterday from along the line of the Central Pacific Railroad. The lot comprises about 20,000 pounds. Nearly all of them are the remains of employees of the company, who were engaged in building the road. The religious customs of the Celestial Empire require that, whenever possible, the bones of its subjects shall be interred upon its own soil, and strictness with which this custom is observed is something remarkable." I have no reason to believe that I mis-stated the date of the newspaper printing date. I have just gone thru the PLACER HERALD for the months of April thru Nov. 1870 – no mention of the train in question. There was a thrid newspaper article from the Elko Independent dated January 5, 1870, states, "Six cars are strung along the road between here (Elko)and Toano, and are being loaded with dead Celestials for transportation to the Flowery Kingdoom. We understand that the Chinese companies pay the Railroad Company ten dollars for carrying to San Francisco each dead Chinaman. Six cars, well stuffed with this kind of freight, will be a good day's work. The remains of females are left to rot in shallow graves, while every defunct male is carefully preserved for shipment to the Orient." The key words are "Six cars well stuffed with this kind of freight." Why would they use six cars well stuffed to transport 50 bodies (unless another train)? Six cars could transport the 1200 bones of the bodies which were prepared in Winnemucca. There are two newspapers which suggest a large number of Chinese deaths, and one stating fifty. Why is there such a negative reaction to the larger number of deaths without considering the possibility of fatalities from avalances, mud slides, rock explosions, and unloading accidents from 1864 to 1870? The Chinese rail workers accepted the risk like any other in order to improve the quality of life for their families in China. These Chinese pioneers traveled across the Pacific Ocean to an inhospitable country because of appearence, language, and food to help develope America when no one else would do the task. "Six cars well stuffed with this kind of freight." Interesting. These words were not included in the previously received transcription. Can anyone provide a scan or photocopy showing the text of the entire third article from the Elko Independent, Jan. 5, 1870? "Strung along the road" could imply simply geographic dispersal, rather than quantity. Of the reported 1,200, according to the Sacramento Reporter of June 30, 1870, "Nearly all of them are the remains of employes of the company, who were engaged in building the road." Yet the reference to "females" (as far was we know there were no female Chinese railroad workers) and "every defunct male" in the Elko Independent of Jan. 5, 1870 suggests that perhaps the shipment was not actually limited to railroad workers, but included bones of all of the male Chinese dead over several decades. Regarding cause of death, "fatalities from avalances, mud slides, [and] rock explosions" would be expected in the Sierra Nevada mountainous portion of the construction. Why would these occur beyond the Sierra Nevada mountains between Elko and Toano, Nevada where these six cars of bodies were said to be collected? We know that there was a smallpox epidemic among the CPRR workers in Nevada in 1869. As I have expressed before, I do not see the report of 1200 and that of 50 as mutually exclusive. Why can't it be that about 1200 remains were being returned to China and about 50 others being buried in Sacramento? One reporter saw one part of the story as interesting, the other saw the other part interesting. On the other hand (or perhaps it should be "furthermore"), I don't see a necessary relationship between the six cars being loaded with remains in January 1870 and the train arriving in Sacramento six months later. They may be the same cars, but maybe not. Still, the "six-car" report does not say that the cars were indeed "stuffed" with bodies. Rather, that it would be a good day's work to stuff those cars with bodies. I doubt very much that they were filled in a single day, and likewise, I see no reason to suppose the cars were indeed "stuffed." On a related side note, no evidence has yet come to light supporting a mass burial of "about fifty" Chinese – in Conboie's or any other Sacramento cemetery. One other thing, which has been said before, but which bears repeating, is that these numbers are not exclusive to railroad workers or to deaths by injury. The reports themselves make clear that not all the bodies belonged to men who were employees of the railroad, and also that the numbers included deaths by disease. One thing we must bear in mind: these newspaper reports are NOT primary sources. They just happen to be the best we have - yet. I feel compelled to note that the Elko article reports that the bodies of women were left in the ground, they were not included among those returned to China. While the discrimination between male and female is interesting, what really interest me is the apparent fact that the Chinese men had women with them. Scan of Elko Independent report attached. Please note, however, that the reporter does not say that the six cars were actually stuffed with bodies! He says that to stuff six cars with bodies in one day would be a lot of work. We have no reason to think that these cars were indeed filled in one day, nor have we reason to suppose that they were "stuffed" at the time the reporter wrote – or any other time. Furthermore, I see no reason to suppose that these six cars (in January 1870) were part of the train six months later. In other words, the process of removing bodies may have involved more than six cars. We just don't know. But there is no reason to make these reports say more than they do. I have found the article that Mrs. Patterson was referring to in her book. The information was found in the January 5th, 1870 Elko Independent newpaper. I have attached the article. I hope it comes thru OK. If it doesn't please let me know. I realize the article is very vague, however I have looked through all the material we have and there is just not a count anywhere...............(what followed is personal comment from a very nice researcher in the Museum). "Dateline..January 5, 1870 Six cars are strung along the road between here and Toano, and are being loaded with dead Celestials for transportation to the Flowery Kingdom. We understand the Chinese Companies pay the Railroad Company $10 for carrying to San Francisco each dead Chinaman. The remains of the females are let to rot in shallow graves while every defunct male is carefully preserved for shipment to the Occident." Note: The NorthEastern Nevada Museum is located at 1515 Idaho St., Elko, Nev. 89901. The phone number there is 775 738 3418. Insofar I paid for the research that is reflected above, I am not too inclined to disbelieve it, nor to pay for yet more. A personal observation: With my own eyes I have seen a female's gold wedding ring, complete with Chinese inscriptions. It was for sale for some $1400., a price beyond my capacity to spend. That ring was found at Shoshone Point, along with a blue on white Chinese porcelain jar, that has been identified by a Chinese scholar as a jar used in a wedding ceremony. I have no reason to disbelieve the scholar that identified it; he is Chinese, born in Taiwan, and has studied his national history for many years. Further, I have seen what I have been told are abandoned grave sites along the old CPRR grade. At the time of the excavation, bones were still evident, as were small Chinese coins. These grave sites are within 200 yards of the grade, they were accidentally excavated by construction workers, and were immediately recovered with earth. The remains were perhaps 5 feet under the surface. Great care was taken to recover these sites with earth, along with ALL the evidence of human activity. Nothing was removed, I am told by the people that were involved. I agree that two articles are not mutally exclisive. The 1200 deaths were collected from shallow graves ALONG THE WHOLE LINE not only in the deserts of Nevada and Utah! They were identify as to name, date of death, and family Tong or village to be return to China for final burial, as was the custom. I have spent many years of research to find any mention of death from smallpox. Please someone please-please provide any information about " it is well known". I have conracted Prof. Sue Fawn of UNLV, Chris Graves,and the Elko newspaper for such information. Also, the Dec 1867 was the last payroll record which listed only 427 Chinese employed, recognizing that records maybe incomplete and destoryed after the date. The six months delay from January to June 1870 was because of preparation of the bodies in Winnemucca , as descriped by J.P, Maden,to ship only the bones back to China. Why does it matter how thse workers died since they were employees of the CPRR? It matters greatly how these workers died, if for no other reason than that human dignity necessitates caring about what actually happened to each individual. Additionally, it is important to consider what was under human control versus what the railroad builders were powerless to influence. Ignoring the causes of railroad worker deaths has led to erroneous and irresponsible claims that the CPRR mangement was indifferent to the welfare of workers, specifically the Chinese. An explosion causing a fatality (which was apparently quite rare) might be (at least in part) the fault of the railroad, a death due to an avalanche or mudslide is less preventable, while the CPRR is clearly blameless for deaths due to smallpox. The apparent rarity of reported deaths due to explosions, even while using incredibly dangerous nitroglycerine to blast the summit tunnel, and the lack of any evidence that death rates varied by race, suggests that the CPRR must have exercised great skill and that the engineers were extremely careful and concerned for worker safety. This despite the extraordinarily difficulty of construction carried out in the mountains during winter. Here is transcription of another previously unreported newspaper article relating to the "Chinese Bones" that may help clarify the what, why, where and when of the return of the Chinese Bones from Nevada. Please note that this story was written a full three months before the Sacramento Reporter and the Sacramento Union apparently first reported the arrival of 20,000 pounds of bones in Sacramento. The following story was generously provided by J.P. Marden of Winnemucca, Nevada. GATHERING THE BONES:—— A singularly superstitious custom yet one which shows the reverence in which the dead are held, particular those who venture beyond the confines of the Flowery Kingdom, and voluntary or otherwise visit the unconsecrated shores of the barbarous nations, prevails among the subjects of his celestial majesty, the Emperor of China. It appears that coolie importing companies, the most enterprising and opulent of which are said to be controlled by white men, specifically agree to return alive or dead the bodies or bones of those bought, hired, or forced to leave their native land and work for the white barbarians in a foreign clime. To fulfill this agreement, which from political motives alone, the said companies do the latter, the remains of all chinamen, no matter from what cause death ensued, are carefully collected at stated periods and shipped to the land of their origin, where they again flourish in the vegetable kingdom in the shape of huge onions and cabbages. A goodly number of Johns delivered up the ghost along the line of the Central Pacific railroad, and in accordance with the custom, which owing to the intolerable stench it engenders, were, in our opinion, better in the breach than in the observance. A few chinamen with cars specially detailed for that purpose, have been engaged in the ghoul like operation of disinterring their dead countrymen and boxing them up preparatory to transporting them to Canton, Pekin, Hong Kong or some other point in the Celestial Empire. The bones of those who died early in the fight, and from which all flesh has decayed, are broken into suitable lengths and deposited in small boxes, while the skeletons of those recently deceased are carefully prepared, the flesh all being scraped off, and placed in correspondingly sized large boxes. The localities where the scraping operations are performed are marked with numerous wax tapers or joss lights, and bowls of boiled rice on which after the departure of the celestials, the Piutes and hogs, if there are any in the vicinity, feast with avidity. Two carloads of bones prepared and boxed in the most approved manner, and labeled with appropriate Chinese characters, given name, date of death, and company to which the deceased belonged, were shipped from this place to San Francisco on last Tuesday night. (March 6, 1870) From thence, it is presumed they will be sent to China immediately, and delivered over to the authorities who will probably dispose of them to some bone-dust or manure Manufacturer. "Note: The coolie importing companies" referred to in the above newspaper story were the "Chinese Six Companies" that were in fact, not labor contractors or owned or controlled by the "white man," but were six independent Chinese Benevolent Societies. They represented the Chinese immigrant who paid their respective company for their benefits, which included returning their remains to China. Their names were, Ning Yuen, Hop Wo, Kong Chow, Yeung Wo, Sam Yup, and Yan Wo district associations all located in Chinatown in San Francisco." The shipment of Chinese bones from the Winnemucca, Nevada area continued for many years and was reported in the newspapers as late as 1878. The shipments were not necessarily in large quantities as it was reported in The Silver State (Winnemucca, Nevada) Dec. 20, 1877 as "four Chinamen were boxed up here and forwarded by freight train to San Francisco to be shipped to China" and again on Nov. 7, 1878 as "the remains, or rather the bones, of twelve defunct Chinamen were shipped from here last evening to the Flowery Kingdom." Whether these numbers were added to another passing shipment in the special Chinese Dead Cars goes unreported and unknown. It has been accurately reported for years that many of the Chinese who died in this country were to be returned to China. It was a requirement of the Chinese Government that the companies importing Chinese labor agreed to return "alive or dead" the bodies or bones of those who were bought, hired, or forced to leave their native land" whenever possible. The Chinese Six Companies were agents of the Chinese Government and the immigrants had paid these Benevolent Societies to return their bones long before their deaths. How they died apparently was irrelevant. The speculation that was generated on the cause of death of the Chinese that were reported as "about 20,000 pounds of bones" "of perhaps 1,200 Chinamen" by the Sacramento Reporter was in my opinion, premature, as the since discovered newspaper stories appear to be more factual than the wild speculation by the reporter of the June 30, 1870 Sacramento Reporter. It seems to me that there are too many interested minor historians that want their history right now without doing the necessary research. 20,000 pounds of bones all of a sudden represent thousands of Chinese laborers brutally killed on the construction of the Central Pacific Railroad. This kind of speculation and reasoning has caused many of the myths surrounding the construction of the Central Pacific to become reported as fact, the result of nothing more that wild speculation by writers who fail to seek out the truth of history. Shades of Stephen P. Ambrose! – can't we have a little peace? Had it not been for Chris Graves pushing his friends to help in finding the truth "of the Bones" I imagine the entire issue would have been entirely forgotten, or worse yet, become another legend of the thousands of Chinese laborers brutally treated during the building of the Central Pacific being adopted as fact. It simply is not the truth. We continually see that myth crop up in the questions from young people who write to the CPRR.org website for answers and who apparently have been taught that all our early Chinese immigrants were victims rather than contributors to our nations history. I'll get off my soap box but before I sign off would like to summarize what I believe the information has so far indicated. Mind you, this is my opinion only and probably no better or worse that anyone else's so please bear with me. The remains of deceased Chinese immigrants were returned to China long before 1870 however it apparently was not a news item as there was nothing to call attention to that fact. Not until the news stories beginning in 1870, after the opening of the Pacific Railroad, was there any great attention called to this issue. I assume it was because there were apparently several box cars, marked with Chinese characters, used exclusively for the transportation of the remains of the Chinese to be returned to their homeland and attracted a lot of attention. Frankly, I question the credibility of the Sacramento Reporter who did little more than to report that something happened on a given day and then went on to speculate on the facts. 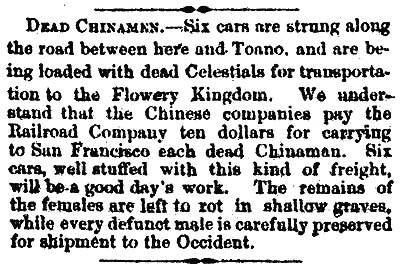 In the Elko Independent of Jan. 5, 1870, whose reporter was at least at the scene, reported that the Chinese Six companies were paying the CPRR $10 to transport the remains of "each defunct male" to San Francisco. He also commented that "the remains of the females were left to rot in shallow graves." This reporter did not comment on how any of these poor souls were employed however it is a fact that they were employed everywhere, on the railroad, in the mines, in laundries, homes as servants, on ranches, etc. The fact is that eventually they all died, thousands of them as did all the other races, however the Chinese were the only ones whose culture required that their remains be returned to their homeland. Many of them were, but not all as evidenced by the Chinese graveyards scattered all over the West. The females were later addressed in A History of Winnemucca, Humboldt County, Nevada as having been sold into slavery by their own families in China and many came to America as slaves. Females were held with little regard and unwanted female babies were often murdered by their parents and the Chinese themselves held their females in little regard. Charles Crocker nor J.H. Strobridge would stand for females being employed in the construction forces, they had problems enough. I would challenge anyone to prove any claim that Chinese women were employed by Crocker or Strobridge on the CPRR. The March 12, 1870 Humboldt Register, quoted above, gives a good description on just how the remains were handled and cared for. They were shipped on a predetermined schedule, probably determined by ship sailings from San Francisco to the Orient, and necessary as Chinese remains were being shipped from all over the West to San Francisco and other places as evidenced by the Sacramento Union of June 30, 1870. It was interesting that the story reported that "fifty defunct Chinamen who died from disease or were killed by accident while working on the line of the Central Pacific Railroad" – "were to be interred in Conboie's private Cemetery as have about one hundred others similarly deceased." The reporter doesn't speculate on how or when they died, simply that they all died while working on the CPRR. For a Cemetery to accept fifty sets of human remains for burial at one time suggests to me that they probably had a contract to take care of that number and also suggests to me that Charles Crocker may well have had a hand in this arrangement. Would he have felt responsible to take care of anymore that the construction accidents is anyone's guess. Had it been the Chinese Six companies the remains would have been returned to China. Crocker on the other hand had an interest in keeping his Chinese employees happy and the cost during the 1860's and 1870's would have been very little. The cost of preparing the remains were born by the Chinese themselves and in one circumstance the CPRR was paid by the Chinese Six companies to transport the remains as far as San Francisco so Crocker's cost may have only for the burial. It was common to only pay $5 or so for an interment, particularly in a private cemetery. If Charles Crocker could bury 150 Chinese that had died while working on the construction of the Central Pacific for under $1,000 it would have been a small price to pay to take care of the remains. As the Chinese culture required their dead to be cared for I suspect that the men who were killed in land or snow slides, froze to death or other accidents as well as from disease had their remains kept together at places that could later be found so when circumstances allowed the remains could be reverently taken care of. So – records must have been kept and burial locations marked so when the pressure of construction was over and the line opened for traffic there would be more time to finish taking care of the remains. Perhaps the Chinese kept the records and burial locations. As we do not know what portion of the one hundred and fifty Chinese buried in Conboie's private cemetery in Sacramento died as a result of construction accidents it appears that the number of those accidental deaths were probably much less than some of the wild speculation of thousands that some have tried to project. There simply is no evidence yet discovered. All that said, it is my belief from the evidence so far discovered that the deaths of the Chinese laborers from preventable construction accidents were no more that a proportionate share of other workmen and probably did not total more than 50-150 at most. "Conboie's private cemetery" no longer exists in Sacramento under that name and it would require some research to determine what became of it. I agree that the cause of death matters for what it tells us about the construction of the railroad, as well as for what it tells us about how the workers lived. It is one thing to say that so many died while working on the construction of the railroad, and another to say that so many were killed while working on the construction of the railroad. If, for instance, we knew that 1000 workers were killed in the collapse of a tunnel (to invent an event), but that no workers died of disease, we have a much different picture of things than if we learned that none were killed by accident, but all died of disease. Likewise, an even different picture emerges if we were to learn that 1000 workers were killed of gunshots on Saturday nights, but that none died of work related injuries. There are today individuals driven by social motives who look upon the railroad's Chinese workers as adventurers who took advantage of an opportunity in the face of hazards and peril to better their place in life. Others, however, attempt to portray the Chinese workers as victims of greedy capitalists. The number of deaths and means of deaths are of interest to both. As historians we serve the Chinese workers best by finding out what can be learned about their lives, ambitions, experiences, and deaths. Out in Nevada, the tracklaying gangs had yet to pick up speed ... Huntington had sent Charley Cricker a telegram from Salt Lake City, upbraiding him for delays and inefficiencies. It arived at the Humboldt comp at the worst time. A few laborers turned up with cases of smallpox and it sparked a panic. "The small pox completely demoralized our track laying force" Charley told Huntington, "& they could not have laid much more Iron if they had it, as very nearly all the White man left the work & most of our best foremen also. We are breaking in Chinamen & learning them as fast as possible. They have much to learn but are apt" Then, he said, someone handed him Huntington's telegram. "Strobridge sick with a very bad cold & afraid it was the small pox as symptoms were very similar. Men running off scared out of their senses. Two cases of small pox among the wood choppers at Elko. Thermometer 10 degrees below zero—& everybody in a demoralized condition—on top of all your dispatch that if we failed it was my failure as I had the means' &c &c" Huntington's telegram was "very encouraging" Crocker wrote with undisguised sarcasm, "was it not?" ... Happily, life in eastern Nevada for supervisors and tracklayers alike had changed enormously for the better in only ten days. The smallpox epidemic was almost over; they had established hospitals on wheels, so-called—there is no evidence that any doctors were present. "Only one new case there last week" Hopkins rather coolly reported to Huntington on January 31. "Nearly all died who went into the pest cars, & those who did not die increased the panic among the men more than those who died and 'told no tails'"
OK, I'll wade in again. First, I have always thought that CP death totals based solely on totaling up the numbers listed in articles about individual accidents greatly undercounted the actual number of dead – for Whites and Chinese alike. And I'm fully ready to believe that 1200 Chinese might have died in the course of construction the CP. But until we look at different types of evidence – outside of newspapers – and do come comparative studies, I don't think we will be able to really say just how many deaths there were with any level of certainty. I am inclined to believe that, at least officially, Chinese women were not employed in the actual construction of the railroad. (We'll leave out women passing as men, something that while not frequent, was likely more common in all cultures than is often realized.) How many women were actually present in the construction camps, and whether they were providing cooking and cleaning, and/or other services, I can only speculate on in the absence of solid evidence. The newspaper article certainly suggests that women were present, at any rate. In as much as the Chinese companies are paying the Central Pacific for shipping the deceased Chinese men, it seems entirely possible that some Chinese who were not employed in construction the railroad might have had their bodies included in the shipments. None-the-less, I suspect that the vast majority of bodies were of construction workers, and that any others were at best a tiny fraction of the total. While the Sierra Nevada is certainly the major mountain range along the Central Pacific, the State of Nevada is not flat. Blasting through the Palisades, the Pequop Mountains, and around Promontory, for instance, offered plenty of opportunities for blasting accidents, etc. I note several times in the 1870s when snow blockaded the Central Pacific in the Pequops – there is plenty of snow there, too. About the Chinese payroll records ending in Dec. 1867, it MIGHT have something to do with a change in work contract. Perhaps the Central Pacific entered into a new contract with Crocker & Company that resulted in the railroad not keeping payroll records – perhaps with Crocker & Company taking that on, or perhaps even subcontracting that to the Chinese Companies. (For instance, I believe there was a new CP contract for work in Nevada, and the declining payrolls in late 1867 may reflect wrapping up work in California, with a shift of forces into Nevada under a new payroll system that CP did not have to keep.) In addition to the Chinese, we know the CP (or its contractors) employed many Native Americans in 1868-69 across Nevada, and also contracted with the Mormons for work around Promontory. If we can find any records speaking to these groups, perhaps we might get a clue about where records for the Chinese might be. Among other things, I am interested in recording the names of specific workers (Chinese and otherwise) who performed specific jobs. For instance, I'd like to have the names of all 8 Chinese who laid the last CP rail at the ceremony at Promontory. It would be interesting to know the names of the Chinese on the drilling crews in Summit Tunnel. Can you assist in documenting the information that Mrs. Strobridge tended the Chinese workers sick with smallpox, in the process becoming infected herself, and that in later life the pock marks were evident on her face? Is there a portrait photograph showing the effects of smallpox on Mrs. Strobridge's face? Also that nearly all that went into the pest cars died. Mr. Chew asks for documentation of the smallpox outbreak among the CPRR workers in Nevada in 1869, saying "I have spent many years of research to find any mention of death from smallpox. Please someone please-please provide any information ... "
The information on Mrs. Strobridge's small pox comes from family interviews many years ago with Mr. E.K. Strobridge, grandson of James Harvey Strobridge, who related the family story. I have seen photos of Mrs. Strobridge's scarred face, the result of the small pox, however do not have a copy. Mr. E.K. Strobridge died about 25 years ago. [Regarding] Bill Chew's request for documentation ... David Bain readily quotes, and provides the documentation, from the CP Huntington Papers about the small pox problem on the Central Pacific as ... as you quote from a letter from C. Crocker to CP Huntington. That information is ... on your FAQ's page (near the very bottom of the page). Contemporary newspapers, especially in San Francisco, tell of the Small Pox epidemic in California from about mid 1868 on and the effect on the population. Small Pox spread from San Francisco east, that is where the construction forces on the railroad became infected. Unfortunately at the time I was reading those papers I did not copy or make any references to the stories – Just never thought about it. These stories may well report on the effect in the mining camps, the foreign population, local Indians, and others who may have been so susceptible to this horrible disease. I just never did any research in this area but the information is there if someone wants to look. ... As you probably have accepted, Bill is determined to prove that thousands of Chinese laborers died during the construction of the railroad and cares little about the causes, only the numbers, and to my knowledge, has not, or will not accept any data that does not support his belief. He comes across to me as determined to prove the deaths of the Chinese during the construction period was the result of brutal and reckless treatment by the managers and cannot accept any other premise. Nothing could be further from the truth. Sadly, he does not understand the history of railroad construction. He has continued, and does to this day insist on the accuracy and meaningfulness of the numbers he extrapolates from the CPRR Payroll records, which in fact were not the Central Pacific's employees but those that were on C. Crocker and Company's payroll. I have tried to advise him on a couple of occasions that the reason no payroll records were found after December 1867 was that the C. Crocker and Company no longer had the contract for construction. It had been assigned to the Contract & Finance Company, still owned by the Associates and C. Crocker but was organized to allow C. Crocker to get out from under the control of the CPRR's Engineer Corps. and help reduce the costs of building the railroad. From Jan. 1, 1868 Charles Crocker had his own Engineer Corp in his employ and under his and Strobridge's control and Montague and his staff no longer had the control of the day to day engineering. That is one reason that Lewis Clement was moved to Utah to work with the Mormons and their contract construction and reported to Stanford and Montague after that date. As you probably know Clement pretty well worked back from Utah until the Mormons completed their last grading contract at Toano, Nevada. From that time until May 10th Crocker & Strobridge controlled the construction and engineering all the way to Promontory. I started to rebut Bills message and claims but thought the better of it. I sure don't want to hurt his feelings but have a hard time accepting his conclusions. ... The above sources I relate to are the only ones I have come across that relate to the Small Pox epidemic. The researcher that has been looking for our trains sends the following message today. Your thoughts are appreciated. There was no Charles Crocker Contract and Finance Company.Charles Crocker had resigned from the Central Pacific's Board of Directors in 1862 and was not part of approving the awarding of contracts. As a contractor he did receive several construction contracts as Charles Crocker & Company. The Contract and Finance Company was formed in late 1867 and was awarded the contract to build the Central Pacific eastward from the California/Nevada State line. So, our researcher has gone thru the papers of July, 1870 in San Francisco, and has found NO MENTION of a train full of deceased Chinese workers. And, according to this email, no ships sailed for China in the period July 1-July 30, 1870. A Chinese scholar is, as this is written, going thru the records of boats sailing from California to China in the period July 1 – Sept. 30, 1870, in an attempt to find a record of such activity in China. Should something surface, I will advise you immediately. Hmmm. Was there a newspaper published in Chinatown in San Francisco? And does it survive? And is there someone who can read Chinese who could look through it? ... The fellow working on the Hong Kong end (apparently shipping records for all of China are maintained in Hong Kong) is serving pro bono, bless his heart. Excellent response. My researcher I assigned to review the old railroad records at a San Francisco repository whose name I have forgotten but whose executive's name was Armour Eagerblade (!) spent a week there and then told me the PI Co records were with the other interesting stuff. I contacted Charles Crocker IV at his bank and he agreed to send all PI Co records to Stanford. That is why they are there. But Stanford is sticky about letting people look at their collection. My recollection is that no payrolls were found but that was almost 40 years ago and my memory could be way off. Stanford at that time had a very competent archivist who is long gone and Dave Myrick and ohers tell me the current archivist has no plans to catalogue the huge records collection SP gave them circa 1996. I have a copy of what we gave them, thanks to a friend, and if of interest I will send you a copy. I did spend some time wandering through the online Stanford's user guide for the collections. I recall they listed on payroll book for the 1880's (1883? ), but I didn't see any more. Also I didn't see much extending back to the Contract & Finance period, although there must be a bit, since their start date for the collection is listed as 1867 I think. As to the more recent material from SP, they have been making at least some of it available in recent years. But I don't know how much.
" ... I know when workers arrived San Francisco, one of those "Tong" in Chinatown would pick them up , either by same hometown or by same surnames, before they heading to work in mine or railroad. They also have to pay their "Tong" due, in case something happen, the "Tong" will use the money to arrange their bones back to their family. I ask a friend who came from one of the three counties where most of railroad workers from in Canton. He told me, in the country side, besides some Western style buildings that were build from the money sent form US, he saw some tombstones state what year the burier returned from US. ... "
The Pacific Mail Steamship Co. established a regular schedule to Japan and China in 1867. Apparently the ships first called on Japan, then on to China, which might account for the failure to find any ships for China directly. The Central Pacific's shipping company was the Orient and Occident Steamship Company (also written as the Occident and Orient Steamship Company). I'm not entirely sure when this conpany was founded, but I know it was operating by at least the early 1870s, perhaps earlier. The other major company, with long-time connections to the Orient going back to the 1850s, was Pacific Mail Steamship Company. Central Pacific also acquired an important stake in this company in the 1860s. I would imagine most Chinese arrived by one of these two companies. So, did the Chinese workers arrive on steamships or sailing vessels? Many arrived by steam ship, simply because there was a regularly scheduled ship from China. There are references to the Chinese walking towards downtown from the Pacific Steam Ship dock (located where Pac-Bell or SBC or AT&T ball park is now) The route passed through the 2nd street cut, and mobs (sometimes said to be associated with the mostly Irish "workingman's party") would stone them as they passed. I am sure that others arrived by sailing vessel. The sailing vessels are harder to track since they didn't sail on a regular schedule. I note the Sacramento papers in the 1860s recorded marriages, births and deaths of the previous year on Jan 1. these are all organized by month and day. At least one sample has been transcribed. I note in the deaths section that Chinese are included. By surveying the January 1 listing, a person might identify the days that Chinese died, and then check the papers of those days to learn the cause of death. This might give us some insight into Chinese maladies. You are only going to get the deaths which occurred in the city/county of Sacramento. But, the annual summaries are handy for a number of reasons. They often were continued over several days. If the Sacto papers printed such lists, perhaps other papers did as well. And I agree that the actual report in the paper might give some clues about how they died. This is clearly before Central Pacific is involved in major hiring, much less returning of Chinese bodies – clearly the practice predated the railroad (and that should not be surprising). This of course raises questions about "body counts" in later newspaper articles. It means that some Chinese remains shipped on the Central Pacific might have included non-railroad workers. A similar note from 1863. As noted several times involving the smallpox epidemics, what exactly are "pest cars"? They seem like hospistal-based rolling stock, but the moniker seems very derogatory for something like that. Also, are there any documented photogrpahs or stereographs of these pest cars or freight cars used for carrying deceased Chinese? 3 A deadly epidemic disease; a pestilence. "Any organism, usually an animal, judged as a threat to humans. Most pests either compete with humans for natural resources or transmit disease to humans, their crops, or their livestock. ,,, "
I realize the definition of the term, but I do not understand there purpose. It sounds like any employee that was contaminated was placed in a boxcar designed to centralize the disease. However, that seems very unethical and dangerous, as well as expensive. I was wondering if there was a solid answer/definition to the purpose of these cars, and if any pictures of them existed. If the 1200 is to be taken as 100% railroad workers, it would be the only citation of over 100 Chinese dying in any one time/event/disaster, which is why it is probably false. Most cases document around 100, and since the causes of death were mostly harsh winters, smallpox, and explosions from blackpowder/nitroglycerin. I would assume about 200-300 Chinese died building the railroad overall, because it is a nice average and accounts of unrecorded deaths, which probably did not mount too high. I think that the number of 1200 results from the idea that the CP owned at least one of the importing steamship companies, and the number consists of mostly non-railroad worker Chinese that the CP were exporting back. For example, the six-car train could have easily started out empty in Sacramento, loaded with deceased in the California area, traversed the line, picking up deceased railroad workers, and returned to California to be offloaded and shipped back. The word "pest" comes from pestilence. It is indeed derogatory, and when political correctness eventually embraces the sensitivities of germs, the word will likely fall from favor. This is a very practical, reasonable interpretation regarding the number of Chinese dead. One comment. The Central Pacific or its directors did not get into the steamship business until several years into the 1870s, a period subsequent to the movement of Chinese remains discussed in our earlier thread. You know, we've spent an awful lot of energy over the last several years flapping our gums (or is it our fingers) over the same old topic of how many Chinese died, all based on the same, limited, tired old newspaper article. It has been a very long time since anybody brought any new evidence to the table. 1. Newspapers generally report the sensational – then as now. Deaths by injury, accident, murder and the like tend to get reported. The all too prevalent deaths by common individual illness generally do not. 2. An awful lot of work took place miles from any newspaper, and reporter. So even some of the sensational deaths would go unreported. 3. In a sparsely populated area it is difficult to ensure that you have checked all the newspapers needed to collect all the deaths that have been recorded. And we are not even sure that all the relevant newspapers have even survived. 4. In our particular case we have one news article that all by its self appears to suggest deaths in the range of 6 times as many as in ALL other newspapers that have been consulted COMBINED. And we have no additional evidence to help us resolve this quandary. So I frankly think we are just wasting our time replowing this very same ground again with nothing new to add. So let me add a bit more that may at least suggest some directions we might explore. Some time back I transcribed and posted some of the statistical information collected and published after the Civil War (or the War of the Southern Rebellion; or the War of Northern Aggression; or whatever anyone wants to call it this week.) Anyway, I collected death stats from a half dozen web sources and they are now posted on the CPRR Discussion site. I had occasion to glance over these recently. Most of the sources are pretty consistent with each other. In the War, about twice as many soldiers died of simple illness as there were who died as a result of warfare. (And remember in war people are actively trying to kill other people.) Say in a sample 10 people died as a result of military action. Then an additional 20 died of simple illness unrelated to warfare. And accidents don't count in that illness total – an additional 1.5 died from accident or injury – unrelated to warfare. The sources gave totals who died in each category. They reported a death rate of around 23% for Union armies, and 24% for Confederate. If you apply these numbers to the Central Pacific you come up with some pretty impressive death totals – even if you completely leave out those killed as a result of warfare. In that context, 1,200 dead Chinese sounds rather low in comparison. And my gut feeling is that the CP death rate was, indeed, significantly lower than the Civil war example. And that the UP rate was rather higher than the CP rate (labor really was cheap coming from the East). At least that provides some new comparative information. I still don't think we have enough for anything definitive, but it is a start. On pest cars, I believe they were just boxcars parked on a siding away form town where those infected were crowded together. Certainly not one to a car. I think with smallpox, well over half died. Thank you Kyle, that was the sort of answer I was seeking. Also, to slightly correct my previous statement, the most likely possibility is that an empty train left the end-of-line intent on exporting deceased Chinese, picked up more bodies as it went down the line (probably in 100-300 area total on the railroad) and picked up the other 1000+ (assuming 1200 is correct), ended in San Francisco, loaded the cargo onto a CPRR or controlled steamship, and was sent to China. Also, although this is not related, if anyone is interested, Utah's new state quarter design is based on the Transcontinental Railroad meeting at Promontory Point. It will show the spike in the middle, with engines Jupiter and 119 on the left and right sides respectively. I think it is due out this year sometime. Also see, Chinese Coffins 1863-64. "SAMUEL McMULLEN ... was at the head of fifty Chinese laborers, and for two years assisted in laying the main track from Colfax, California, and all the side tracks at Palisade. He was present at Gravelly Ford when sixteen hundred kegs of black powder exploded with a mighty thunder that shook the earth, killing six men and injuring others. ... "
This article speaks of the cemetery. Every accidental death is a tragedy. However, to put things into perspective, it is important to realize that more people die each year by being hit by trains in the U.S. while trespassing on train tracks it seems than died building the first transcontinental railroad. Similarly, far more lives are saved each year by rail travel which is much safer than the travel by horse and wagon, which preceded the availability of travel by train, than died building the first transcontinental railroad. It is gratifying to see that the Stanford University research group has acknowledged the conclusions above from this page, writing in their FAQ's that "Some historians estimate from engineering reports, newspaper articles and other sources that between 50 to 150 Chinese were killed as a result of snow slides, landslides, explosions, falls and other accidents." However, the Stanford Project when using the research done by others should, in each instance where it appears, as is done on this website, cite or link to their sources, both to allow readers to examine the primary source material included here and the analysis (see above), and to provide proper credit, including to the researchers named above for their worthy contributions and excellent work. Our gratitude to Wendell Huffman whose years of work uncovered the short newspaper article reproduced above, the significance of which had not been recognized for more than a century, which has allowed widespread apparent misinformation to be corrected.